1. Timaya ft. King Perry x Patoranking - Kom Kom: Timaya returns with another classic song titled Kom Kom and on this one he featured his own artiste King Perry and Patoranking. Like we all know Timaya has been giving us some decent dance-all songs of late and this one is the best of them all, probably his best song of the year, though there is this small similarity in this song and that of previous song Sanko but all in all this is a decent effort. I don’t know maybe it’s just me but I think King Perry sounded more like Harrysong on this song, the rating will be 8/10. 2. Ice Prince ft. Jesse Jagz - Control Number: On a low, Ice Prince has had a decent 2018, releasing an album, going on tour, it will be unfair not to rate Ice Prince this year. The Super Cool Cat boss makes a return with a new single a week after dropping the video for his previous single (Yawa aft. Peruzzi) and he call this one Control Number which features Jesse Jagz. I have to say this is a decent effort coming from Ice, smooth flows and nice instrumentals, though the instrumentals of this songs sounds so familiar to a song I can’t really place at the moment but aside that Ice Prince came through and this song has the potential of becoming a hit song as the rating will be 7/10. 3. Ckay ft. Zlatan Ibile x Moodchild Sanelly - Container (Remix): Ckay returns with the remix of his previous single titled Container and on this remix he features South African singer Moodchild Sanelly and Nigerian rapper Zlatan Ibile. I have to be honest, I prefer this remix to the original, I like the fact that Ckay did some extra work on the production to give the beats a new feeling and the fact that on this one he only took the chorus and allowed the featured artistes to do their thing and both artistes really came through. The rating will be 8/10. 4. Jaywon - Aje: I have to be honest, after listening for the first 10 seconds of this song, I had to take a second look at the song again just to be sure I was listening to the right song; this is a different Jaywon. It’s like Jaywon purposely keeps his best songs till the end of the end, Aje is a beautiful classic song, the piano inspired song has a very distinctive motivational message to everyone out there. Looking for a song that will keep you going into the New Year? I recommend this song. The rating of this song without a doubt will be 10 by the way Kenny Ogunbe added his vocals to the song. 5. 9ice - Keys: 9ice has proven over time that he’s that artiste that always deliver when the need arises and he has done that with a lot of singles this year but the Ancestor artiste isn’t done yet as he returns with this beautifully composed love song titled Keys as produced by Olumix. 9ice has released a handful of singles this year but if I’m to pick the best I would pick this, the way this song started alone was captivating and yes Olumix outdid himself once again on the production of this song and 9ice once again proves to us that he is still capable of making hit songs. The rating of this song will be 9/10. 6. Vector ft. Daddy Showkey x DJ Magnum - Be Happy: V.E.C is back with another hit, titled Be Happy and on this reggae tune he features veteran artiste Daddy Showkey and DJ Magnum. Vector takes us back to that his Follow Me Dey Go (ft.2face) sound which drove us crazy then but the highlight of this song for me is how Daddy Showkey was able to blend in perfectly. Showkey shows us why he is referred to as the king of dancehall and reggae music in Nigeria, I mean baba killed it mehn. The rating of this song will be 8/10. 7. 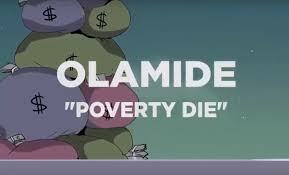 Olamide - Poverty Die: What more can I say about Olamide?, you just don’t know what he will do next, you can’t predict the kind of sounds he will drop next but one thing I have come to expect is that during this time of the year Olamide will definitely have that song that will rock the whole industry. Poverty Die is a spiritual song, produced by Pheelz and it is a song that has gone viral already, the song took over the street the moment it dropped and trust me when I say it will be had to hear any single that will do better than this song this December period and even doing into the new year, the rating of this song will be 9/10. 8. R2bees - Beautiful: The best music duo out of Africa, Ghanaian R2bees are back with another hit titled Beautiful. The Killbeat produced song is nothing but beautiful, these guys just know how to give us hit over hit, while we are still enjoying Supa (ft.Wizkid) they decide to bless us with this lovely smooth love song, the rating will be 8/10. 9. Timi Dakolo - I Never Know Say: No homo guys, but I’m in love with Timi Dakolo, how can an artiste make a song this dope? Chai!! On a personal level this would be my best love song this year. As produced by extraordinary producer Cobhams Asuquo, I Never Know Say is a classic highlife song, done in the original highlife way, like those highlife songs you hear at the bar in the 80’s and early 90’. Listening to this song I can’t help but to think of the great Osadebe and other great highlife acts of the past, this is highlife at its purest, without any doubt the rating of this song will be a perfect 10. 10. Barry Jhay - Normal Level: If you don’t know who Barry Jhay is by now, it’s obvious you haven’t been paying attention to music, his debut single Aiye which was released this year is one of the national anthems that have rocked this industry since it was released and the young act isn’t done yet. His new song, Normal Level is one of the two songs he dropped during the cause of the week and as expected, Barry Jhay continues to deliver steady steady. This is another dope song from him and this song also has all the potential to become a national hit as the rating will be 8/10.